The Great Wallsend Copper Drop is back! On Thursday 23rd May 2019 we will be hosting our 2nd Copper Drop event, with a fundraising target of £1,000. Last year we raised a fantastic £841.49! 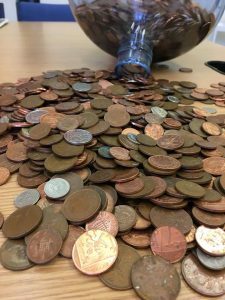 Would you consider rounding up all of those copper coins around your house and donating them to your local charity? We know there are thousands of coins hidden down the back of sofas, in the kitchen drawer or in a jar by the bed! If you would like to put them to good use we can certainly help. You can drop your coppers off at any time of course, but 23rd May is our appeal date and we’ll be on hand to collect donations. From 7:30am – 7pm on 23rd May call in to our office on 205 Park Rd, Wallsend, NE28 7NL, or just drive past and we will collect from you! If you have a large amount to donate please contact us on 0191 2622261 and we will collect from you. If any local businesses or schools would like to get involved then please do get in touch, we can provide you with a collection tin / bucket.